Evaluating secure text messaging solutions can be a time-consuming and confusing process for healthcare organizations, especially with restrictive compliance regulations in place. Once you have realized the need for a secure texting solution, the research, evaluation and selection process could be long and unorganized without the necessary tools or understanding of what your ideal solution would be. 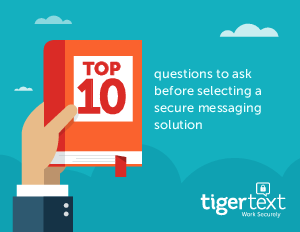 That is why TigerText has compiled the Top 10 Questions to Ask Before Selecting a Secure Text Messaging Solution, allowing you to simplify the selection process and more easily identify what you need from your secure texting vendor. Healthcare organizations can easily discover the top concerns when evaluating secure texting solutions and ensure the solution they select not only meets all functional requirements, but also it’s their use case. Learn all key aspects of a solution including technical requirements, key functionality concerns, and how to determine a vendor’s proven success record with case studies and testimonials.